subroutine Trace – If successful, trash 1 piece of hardware. If your trace strength is 5 or greater, trash 1 piece of hardware. 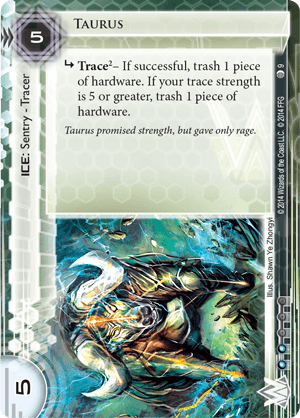 This is a 1x autoinclude for any Blue Sun: Powering the Future or Argus Security: Protection Guaranteed decks I build, as I've found it to be by far the easiest way to trash up to 2 troublesome Plascrete Carapaces. This paves the way for an easier flatline win via Scorched Earth. I've even considered splashing it in a Near-Earth Hub: Broadcast Center deck designed to run Scorches, as it has the extra influence to support it, but since NEH can run Flare in-faction, Taurus might not be worth it there.